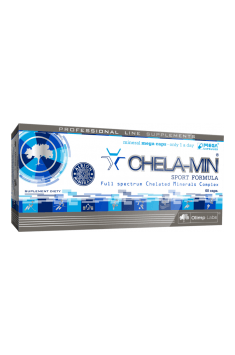 CHELA-MIN SPORT FORMULA® is a specially formulated composition with highly absorbable, highest quality mineral components in the form of amino acid chelates of ALBION®. Calcium – a mineral building the bone structure, strengthening bones and teeth and supporting the movement apparatus during osteoporosis. It affects the nervous system functions and participates in the neurotransmission. It contributes to the blood coagulation, supports muscle functioning and regulates the proper energy metabolism. Iodine – is known for its influence on thyroid gland functions, as it is a substrate for creating hormones produced by this organ. It is crucial in the development of brain and then for the functioning of the nervous system as well as helps to maintain the proper cognitive functions. It helps to keep healthy skin and affects energy metabolism. Magnesium - is one of the most deficit nutrients. It tones the nervous system, allows for a reduction of irritability, contributes to the reduction of fatigue and tiredness. It is involved in the processes of protein synthesis and cell division. It is one of the electrolytes regulating the water management of the body system. Together with calcium, it positively affects the condition of bones and teeth. Zinc – a very interesting mineral of a wide spectrum of properties. It can raise the level of testosterone and block the aromatase enzyme, which results in a reduction in estrogen concentration. It may raise the levels of thyroid hormones. It blocks the overreactive glutamate by preventing glycine from reaching NMDA receptors. It can stimulate the production of BDNF factor which affects regeneration of neurons. It improves skin quality and is very effective in fighting acne symptoms. Selenium – a mineral of strong antioxidant potential. It affects the activity of many enzymes which are referred to as selenium-dependent. It raises the level of glutathione peroxidase, which neutralizes hydrogen peroxide. It forms deiodases which are enzymes converting inactive torixine into active triiodothyronine. It can support the process of spermatogenesis and improve fertility. Manganese – it has a great influence on healthy bones and connective tissues. It may affect libido and sexual functions. The symptoms of manganese deficiency are deterioration of skin quality and hair loss. It supports the fight against reactive oxygen species and the energy metabolism. It affects also the synthesis of numerous enzymes. Chromium – a trace element commonly used for the regeneration of blood sugar and reduction in craving for sweets. It contributes to the maintenance of the proper macronutrients metabolism, such as proteins, carbohydrates and fats. Molybdenum – affects the metabolism of sulphuric amino acids, facilitates iron absorption and protects from anaemia. It participates in the production of enzymes, metabolism of purines and affects the maintenance of healthy bones. Its deficiency can lead to decay and impaired absorption of other nutrients. Potassium – a mineral of electrolytic properties which affects water management. It supports the regulation of blood pressure, the proper functioning of the nervous system and muscles. It is used in the prevention of cardiovascular diseases. Its deficiency may lead to irregular heartbeat and muscle contractions. A package of components contained in the supplement affects the functioning of almost every system in our body. It contributes to the maintenance of healthy movement apparatus, thanks to the strengthening of bones and connective tissues structures. A supply of electrolytes will support kidneys and allows for the maintenance of the proper neurotransmission, which results in more efficient brain functions. It will be also beneficial for the functioning of thyroid gland and energy metabolism. It will neutralise the excess of free radicals which damage our cells. The supplement CHELA-MIN SPORT FORMULA® company is a perfect way to support the whole body system. To sum up, CHELA-MIN SPORT FORMULA® is recommended for people whose diet does not provide the proper amounts of minerals. It will be especially useful for people avoiding food of high nutritional density, such as fruits and vegetables as well as in the periods of excessive body system burden. 1 capsule once a day after the main dish. The preparation is recommended for daily usage as supplementation of a diet in essential minerals. The supplement will effectively complete the deficits of vital mineral components in the organism, which may result from, among others, heat treatment of food, assimilability disorders, accompanying diseases and also physical activity and diet. Microcrystalline cellulose - filler, magnesium stearate - anti-caking agent, gelatin - capsule shell.